South Western Railway was created by amalgamating the re-organized Hubli division from South Central Railway and Bangalore & Mysore divisions from Southern Railway. It has been operational from 1st April 2003 having the headquarters at Hubli in the state of Karnataka. The Railway comprises of 03 divisions, viz. Hubli, Bangalore & Mysore and primarily caters to Karnataka state with 84% of its jurisdiction located there. 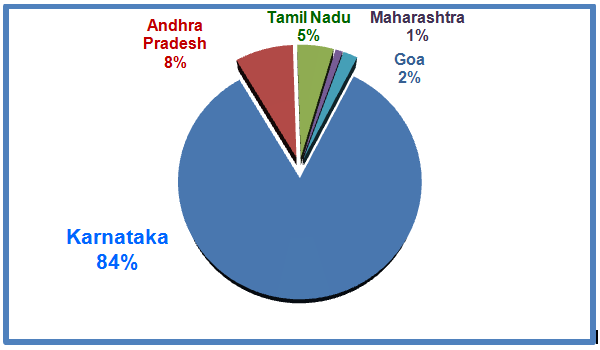 The balance 16% of its route length falls in Andhra Pradesh, Tamil Nadu, Maharashtra and Goa. Bangalore division of this zone is passenger oriented while Hubli & Mysore divisions are fright oriented. Bangalore city is a world famous Information Technology hub of India. Hubli and Mysore are having important tourist places. This Railway hosts a large number of world heritage sites. Some of the important tourist destinations like Hampi ruins, Caves of Badami, Pattadakallu, Aihole, Goan Beaches come under the jurisdiction of Hubli division of this Railway. Mysore division caters to the World famous Dasara celebrations and other historic places like Hoyasala dynasty’s monuments in Belur, Halebeedu, Somanathapura and the famous Jogfalls. There has been perceptible improvement in Railway services across Karnataka and its districts. After its formation 345 km of new line, 598 km of GC and 521 km of doubling have been commissioned. 110 numbers of new Express/Passenger trains have been introduced. Apart from this, services of many trains have been extended and frequency of some trains has been increased for the benefit of travelling public.